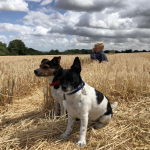 I'm 39, married, Mum to Alfie (nearly 7 yrs) and x 2 Jack Russells and enjoy enjoy rural life in the Hampshire countryside. Family of 3 urgently seeking home help / nanny /housekeeper to support mother, (38 yrs) who has Rheumatoid Arthritis. Mother needs an extra pair of hands to help with general household duties, cooking, cleaning and childcare at either end of the day. -take son to an activity eg swimming. This would suit someone local to the Dean / Sparsholt / Winchester area who loves an active outdoor lifestyle, preparing and cooking healthy food, and enjoys the company of animals and children. We can provide live-in accommodation if necessary, which is separate from the main house. No couples. This role is ideally 2 hours in the AM and 2 hours late PM. Must have a full clean driving license and be eligible to work in the UK. You must be a high energy, confident and positive person with a proactive approach.